Enjoy the process of making rather than the finished piece. It’s great to have lots of beautiful work to put up, but also the enjoyment that is created through making should not be underestimated. Not everything has to look like a Turner painting! It can be the first time they have spent 20 minutes sitting and painting, or the colours that they love, that make the artwork so good. Sometimes we have an abundance of one item that can be used in many different ways. For example, a kitchen roll tube can be used to make a multitude of craft projects, such as owls or puppets, or they can even be used to print with to make a lovely circle pattern. If you have a garden, you could use leaves and twigs to create nature inspired collages. It’s not always about making. Some people like to know more about the artists, rather than make themselves. Print out biographies and share some of your residents’ knowledge. One of them may have been to an exhibition or show that you are talking about. Try to use good quality materials as far as possible. If you want to paint, try to provide the best you can afford. There is nothing worse than painting in watercolours and the paper being too thin so it wrinkles! Use card if you prefer so that it has a bit of weight to it. Acrylics are good paints to use too, they make a nice block colour (but note that any mess can be tricky to wash out of clothes). Showcase what you have been doing in your care home! You don’t need big fancy frames, you could have a pin board which changes regularly. It gives residents pride in their work and also means that their friends and families can see what they’re up to. 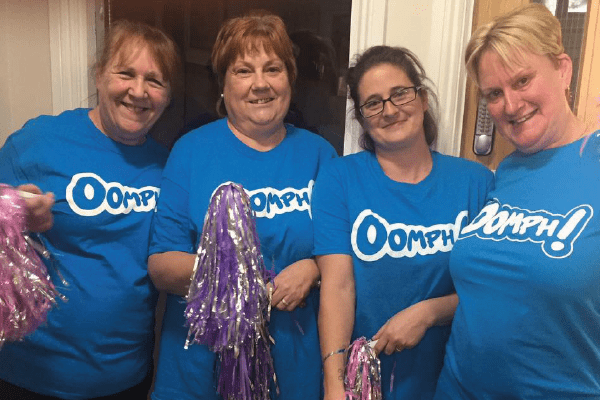 To date, 127 homes have participated in the Oomph! Create workshop, with 208 staff members taking part across the UK. 98% would recommend the workshop, and 77% said it was even better than expected. Our next workshop in the series is based on nature, encouraging residents to get outdoors and appreciate nature, as well as bringing the outdoors in – Oomph! Nature will be launching in March, so watch this space! Country Court Care gets some Oomph! for their residents! “Another great day! Buzzing atmosphere, happy residents, happy carers. Well enjoyed by all despite the cold weather!” One member of staff commented after a recent trip. 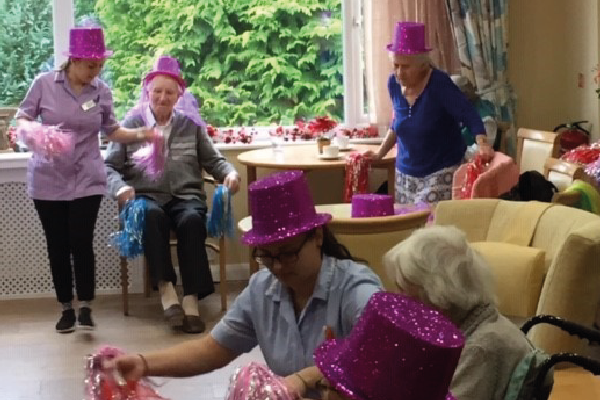 We have partnered with Country Court Care, a leading UK Care Group, to deliver awesome exercise classes and creative activities for residents, as well as engaging trips out. A pilot project has been agreed where 4 homes have been embracing the exercise and activity training and 8 homes have been going out to local destinations. Taking a whole-home approach to activities, staff in 4 Country Court Care Homes have been trained in our Wellbeing Leadership programme. This ensures that they are equipped with everything they need to create and sustain a person-centred plan of varied exercise and activities that residents love. The training is tailored to each home, and focuses on meeting and exceeding regulator requirements. Additionally, engaging days out to a range of destinations are running for 8 Country Court Care homes, with added value and variety to trip experiences created through partnerships with the National Trust and HQ Theatres. 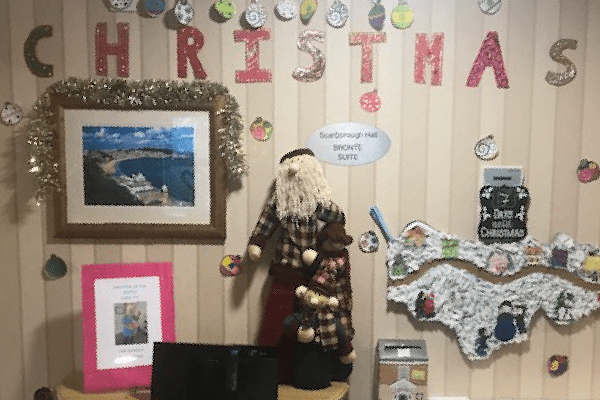 The trips aim to connect residents to the people and places that matter most to them – Country Court Care trips have previously included unexpected locations, such as the Blue Planet Aquarium, the Royal Pavilion in Brighton and the Sloane Square Christmas lights. We have partnered with Sanctuary Care, a leading UK Care Group, to deliver awesome exercise classes and creative activities for residents. Taking a whole-home approach to activities, staff across a number of care homes run by Sanctuary Care, have been trained in our Wellbeing Leadership programme. This ensures that they are equipped with everything they need to create and sustain a person-centred plan of varied exercise and activities that residents love. The training is tailored to each home, and focuses on meeting and exceeding regulator requirements. Falls have reduced significantly at Victoria Nursing Group’s Chartwell, within 6 months of beginning Oomph! exercise sessions in the home. Between August 2017 and January 2018, the home recorded 17 falls, which has subsequently reduced to 4 in the period between February 2018 and July 2018. There is the same resident group in home, so the number has not been driven by a change in resident dependency. The home attributes some of the reduction in falls to Oomph! exercise sessions, which incorporate fun and gameplay into seated physical activity classes. The home runs 2 sessions per week, with 6 or 7 residents participating each time – equating to 10 individuals getting active per week. Falls at the home are measured through use of falls protocol. When a fall occurs, a form is completed, which then goes on to the system for Manager to investigate. Victoria Nursing Group’s Care Quality Director, Emma, will then assess all of the homes each month to determine number of falls and suggest a variety actions to reduce the amount of falls within the home. “Falls have definitely been reduced – regular physical activity has led to people being more mobile and stronger. There is also increased staff confidence when supporting people thanks to the Oomph! training.” said Emma, the Care Quality Director. The impact of the exercise sessions is clear to see in the home. One resident used to be unsteady on his feet, experiencing multiple falls, but since Oomph! started these falls have reduced and the resident has been able to walk into the garden with an improved level of confidence. 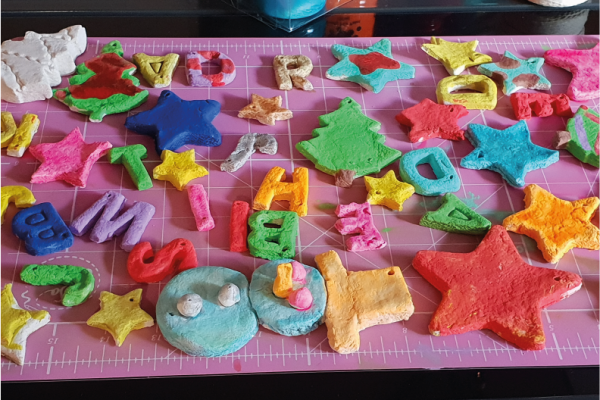 Staff from Orchard Care Homes have been sculpting out new skills at our workshop that focused on painting, sketching and modelling with clay, ready to take their newfound talents back to their respective homes for the benefit of residents. 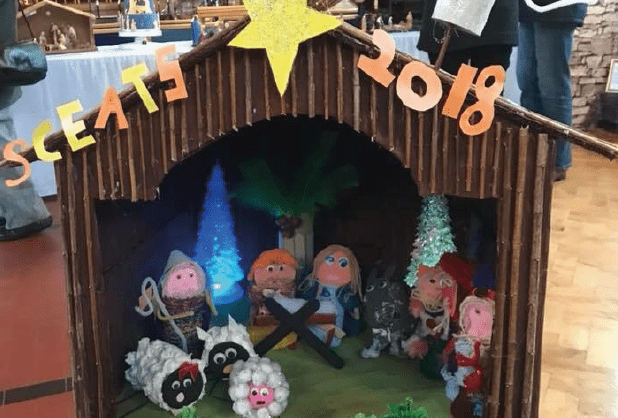 The workshop, held at Lofthouse Grange and Lodge in Wakefield, brought together staff from five homes, teaching them the fundamentals of different skills and how they can practically apply these. This means that residents will soon be involved in the Oomph! Create sessions, which aim to reignite past passions and encourage development of new hobbies. 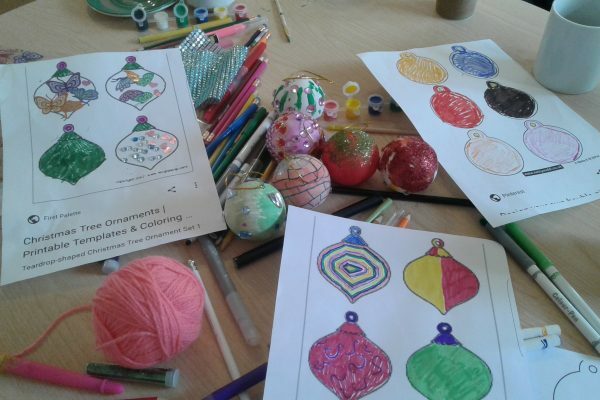 “One of our residents at Lofthouse used to be an art teacher, I am sure she will not only get involved with Oomph! 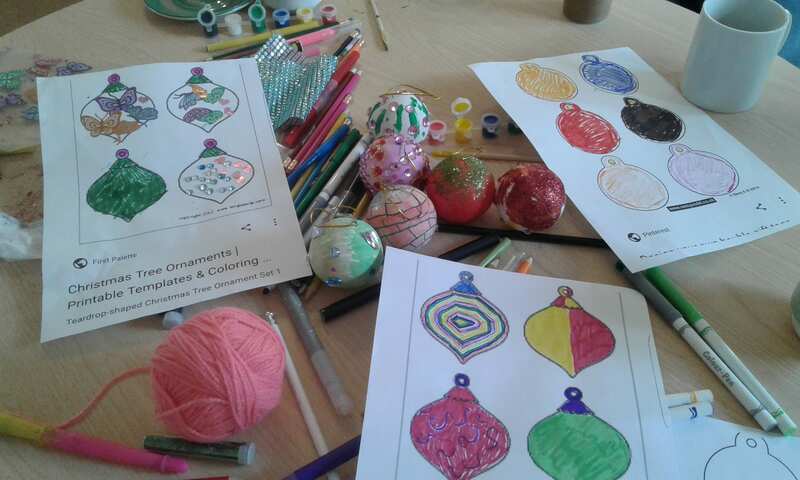 Create – she may also help run the class!” said Activities Coordinator, Kirsty, from Lofthouse Grange and Lodge. The workshop is one in a series of Oomph! workshops that Orchard Care Homes staff will be attending, with previous workshops focusing on adapting sports, music and relaxation techniques for the care setting. Oomph! have partnered with The Lightbox gallery and museum in Woking to design a brand new workshop for care home staff. 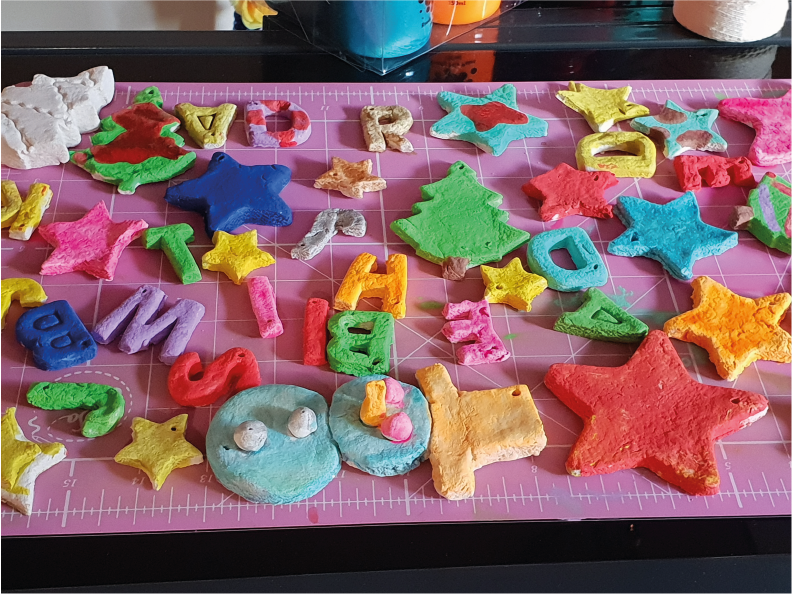 Staff have been sculpting out new skills that focus on painting, sketching and modelling with clay, ready to take their newfound talents back to their respective homes for the benefit of residents. 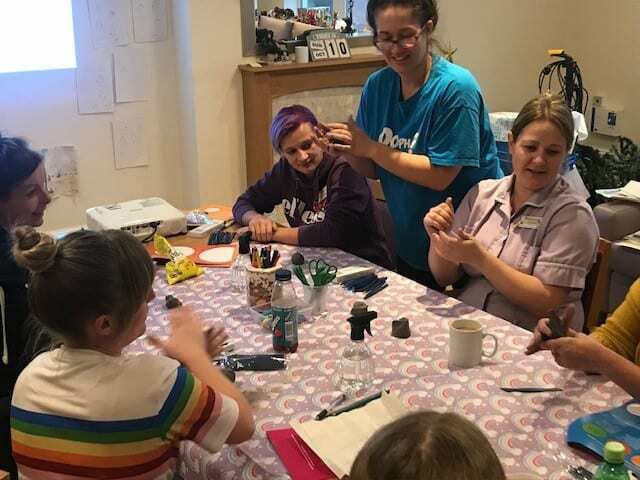 Held across various regions in the UK, the workshops bring together staff from local care homes, teaching them the fundamentals of the three different skills and how they can practically apply and adapt these for residents. The workshop is one of four that are run throughout the year, as part of a wider wellbeing training and support programme run by Oomph!. Previous workshops include sport, relaxation and music. The aim is to upskill staff so that they can reignite residents’ past passions and encourage development of new hobbies. 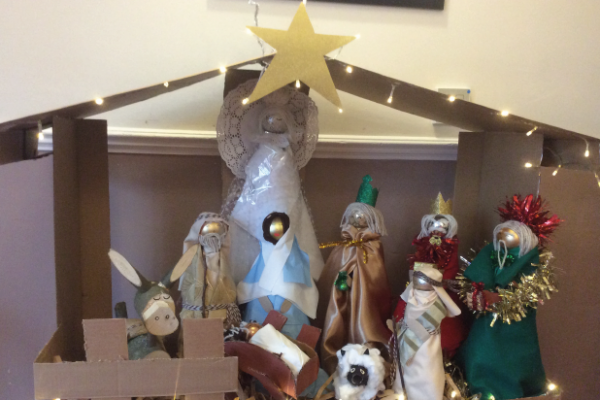 Heather Thomas, Learning and Engagement Manager at The Lightbox added “We are incredibly proud that we have been able to share the amazing Health and Wellbeing work we are doing with older people at The Lightbox to those in care homes across the country. 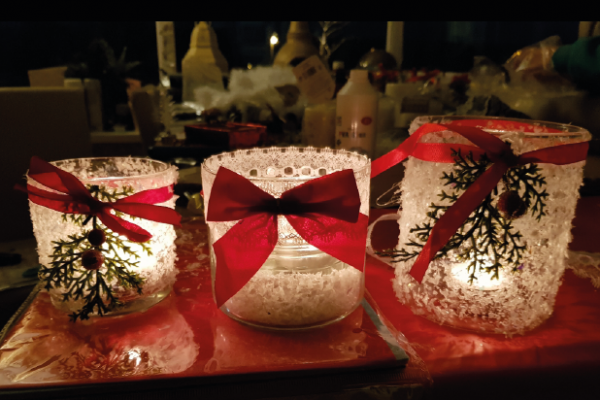 Being able to inspire and encourage residents to be creative in whichever way they want is vital to their health and enjoyment of everyday life. The Lightbox gallery and museum in Woking is home to three stunning galleries hosting a huge range of regularly changing exhibitions featuring world-renowned artists. 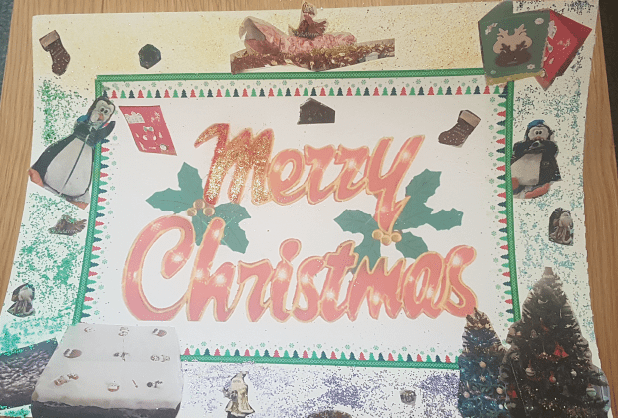 Alongside the exhibition programme they also run a number of stimulating community projects for a range of participants including the local homeless, those with mental health conditions and individuals living with the early stages of dementia. 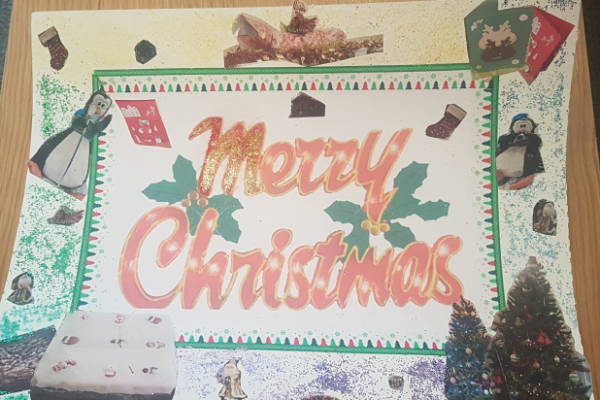 The Lightbox believes that art is a powerful therapeutic tool which can help promote happiness and provide relief from the difficulties of the everyday world. The varied range of stimulating community projects, including Art in Mind and Art Without Walls, enables participants to feel positive and creative without any expectation or pressure. 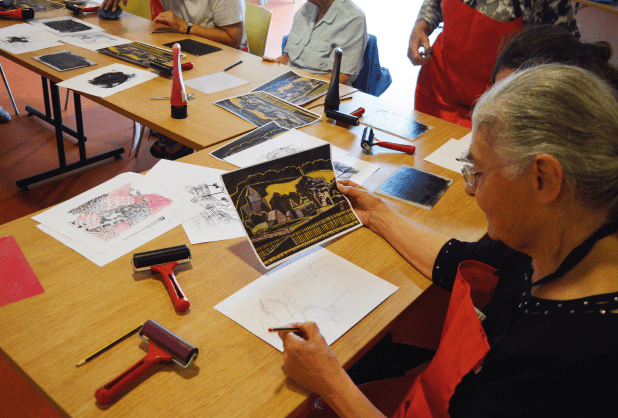 Art in Mind is a programme of monthly workshops for people in the early stages of dementia and their carers or supporters, supporting research that artistic stimulation prolongs the ability of people with dementia to play an active part in society. 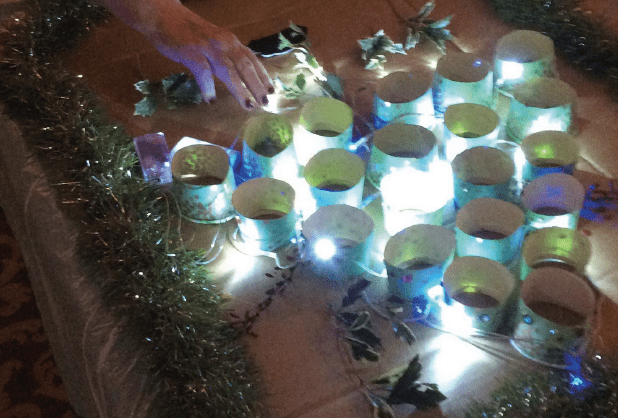 New to the programme is Art Without Walls, an arts-based outreach programme where The Lightbox delivers an art workshop in local care homes for people who would otherwise not have access to arts and heritage services. Walking into a care setting for older adults, you might be surprised to see children’s tricycles in the gardens and toys in the lounges. But, thanks to intergenerational care and learning programmes, it’s now a sight that is becoming much more frequent. As the UK catches up with The Netherlands, who have long been reaping the benefits of intergenerational programmes and shared sites, interest is now growing at a remarkable rate. What are intergenerational programmes in care? Ongoing intergenerational programmes that are purpose built to bring different generations together are now being introduced in care homes throughout the UK at a fast pace, enabling residents to share experiences that are not only thoroughly enjoyable, but proven to be extremely beneﬁcial. 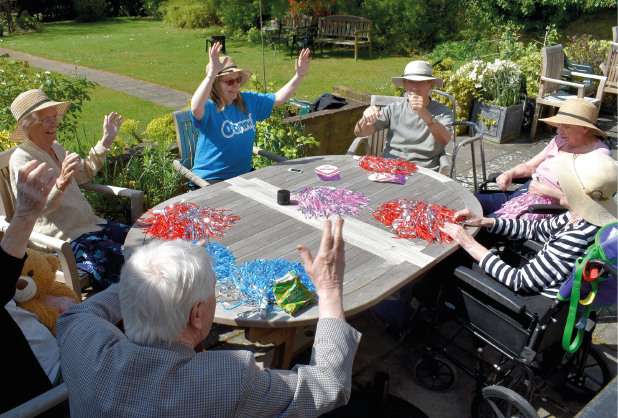 These programmes, often based within care home living arrangements, are environments that can see various age groups interact through planned intergenerational activities. For example, care homes and centres within the retirement community are inviting local children in for regular singing and music sessions, sports days and arts and crafts workshops. Taking this one step further, many are also incorporating on-site childcare, including nurseries and – in some cases – even providing housing for grandparents raising grandchildren. These shared sites provide a fun and positive environment where children and older adults can learn and interact in shared space. Some care settings focus on reducing staffing shortages by offering on-site childcare, including nurseries and pre and after school programmes. In addition to offering all the benefits of intergenerational activities and programmes, there is the added employee benefit, and many of these programmes can – and do – have reduced costs significantly through the pooling of resources. Intergenerational shared sites and activities have proven benefits. Older adults who have access to these are less likely to feel isolated and lonely, and in contrast, feel more valued within their community, with a purpose, providing hope for the future. Those participating can see improved mental health, improved socialisation through regular contact with children, improved self-worth, increased independence and an improved sense of wellbeing. 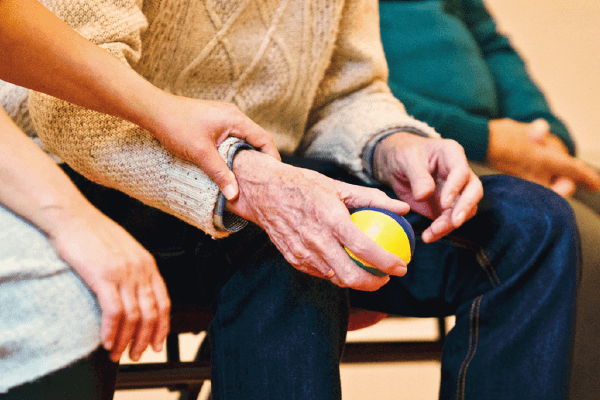 For older adults living with dementia, intergenerational programmes have shown lowered levels of agitation and delayed entrance into a nursing setting. But what about the children? Well, intergenerational programmes also benefit children. These benefits include enhanced social skills, lower levels of aggressive behaviour and improved academic performance. 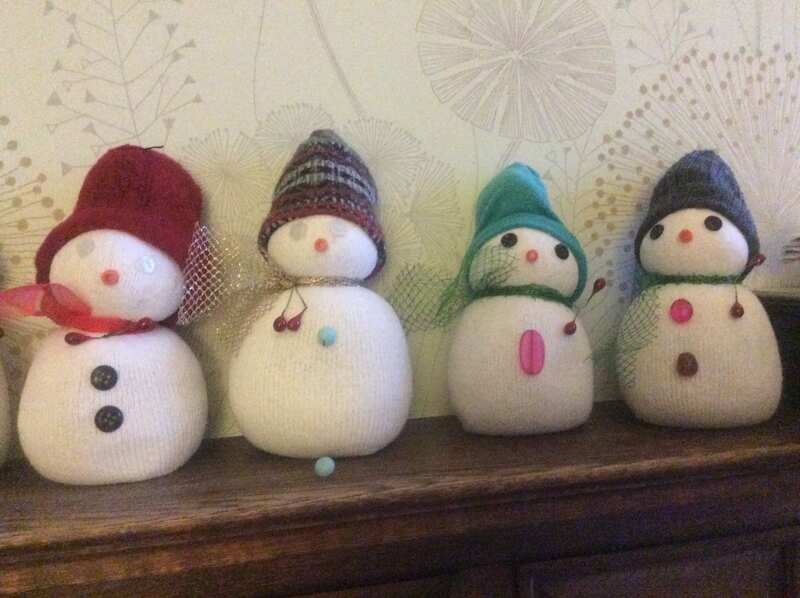 There are some great ideas on how to introduce intergenerational activities into care homes – such as inviting local schools and playgroups to visit the care home to make friends with residents and participate in activities like baking, knitting, performing and rehearsing plays, Harvest festivals and Christmas carol singing. 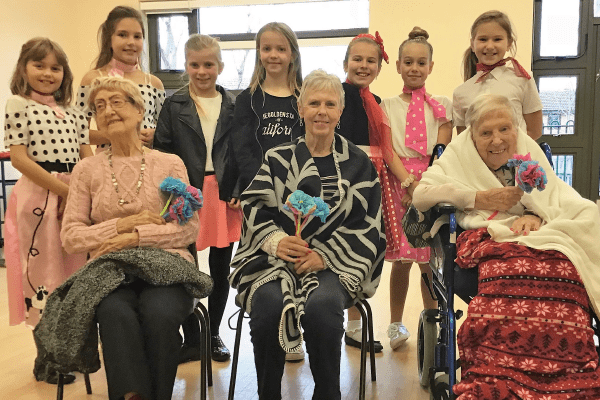 These activities can also span beyond the care home walls – for example, Barty House Nursing Home, in Maidstone, Kent, have developed community links with a local school, recently taking a trip to visit the students to help with their 1950s project (pictured). These links ensure that knowledge and experiences are passed down through the generations. In summary, children can be a rare sight for many older adults living within care settings, but – with the rapid growth of intergenerational programmes across the UK – this will soon change. It is inevitable that the increasing creativity and diversity of the care environment will prompt these programmes to become an integral component of care – an absolute must-have for resident wellbeing. 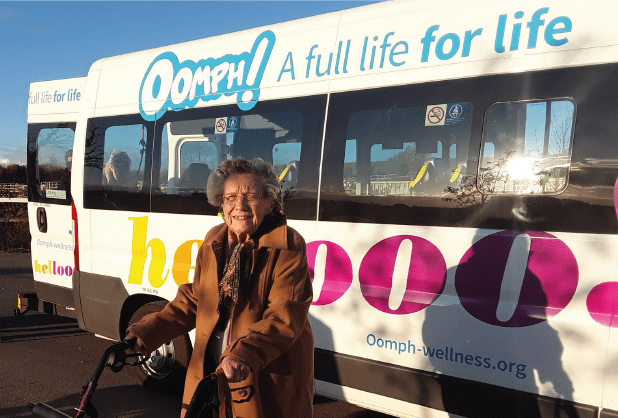 Somerset Care gets out and about with Oomph! We have partnered with Somerset Care, a leading UK Care Group, to provide engaging trips out for their residents. Trips are running for 26 Somerset Care homes, who will be visiting a varied range of locations, spanning everything from arts and culture, to food and dining, to nature and the outdoors. Partnerships established with organisations such as the National Trust also mean that homes will be getting out and about to beautiful houses, buildings and gardens in their local area. Previous Oomph! trips have been to unexpected and exciting locations, such as cat cafes, gin distilleries and racing tracks, as well as more day-to-day spots in the local community. These trips out aim to connect residents to the people and places that matter most to them, so that they can reignite old passions – or discover new ones. Somerset Care homes have already headed out to local venues such as Bristol Aquarium, Fleet Air Museum, and Haynes Motor Museum.